Panasonic is expecting its lithium-ion batteries' sales from Tesla's Gigafactory production to grow from 180 billion yen in March 2016 to 400 billion yen ($3,98 billion) by March 2019 thanks to the successful unveiling of Tesla's upcoming Model 3 which has gathered 400,000 pre-orders already. Thus helping the U.S. based electric car manufacturer to more than double its annual sales in three years. 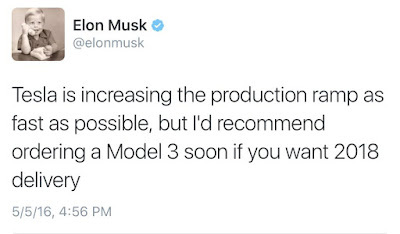 According to Elon Musk, Tesla will increase its Model 3 production ramp to 200,000 by late 2017 before reaching 400,000 in 2018 while aiming for 1 million total production of all its models by 2020. The Gigafactory is set to officially open end of this month. Kenji Tamura, an executive officer in charge of Panasonic's automotive and industrial systems business, said the company is "currently installing machinery and the recent accident won’t affect our plan to launch the factory this year,". Tamura was referring to the fatal accident on May 7th in Florida involving a Model S and a trailer truck. According to Tamura, The Japanese company will see a combined annual sale from automobile batteries and energy storage products to grow to 500 billion yen, around 2.5 times sales in the last fiscal year. He hinted to reporters that Panasonic will be able to keep its exclusive contract with Tesla by consistently improving its technology and increasing the lifespan of its batteries. 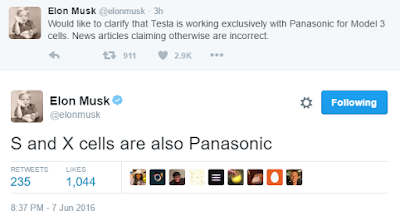 Tamura added that Tesla isn’t the only customer for Panasonic car batteries. In addition to the U.S. factory, Panasonic is building a battery factory in China that is set to start operating by March 2018. It opened a battery R&D center in Yokohama, Japan, in April. 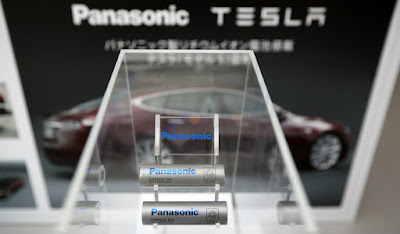 Panasonic Energy Corporation of North America said it was gearing up for significant growth at the Gigafactory where it will produce lithium ion cells for electric vehicles and other innovative products. The company said in May it was ready to bring forward its $1.6 billion investment in the Gigafactory if required to meet demand of the Model 3 after reservations reached 373,000. "We will do our best to move up the schedule if requested," Yoshio Ito, head of Panasonic's automotive and industrial systems (AIS) division, told reporters at a briefing, adding "We just don't want to be a bottleneck." 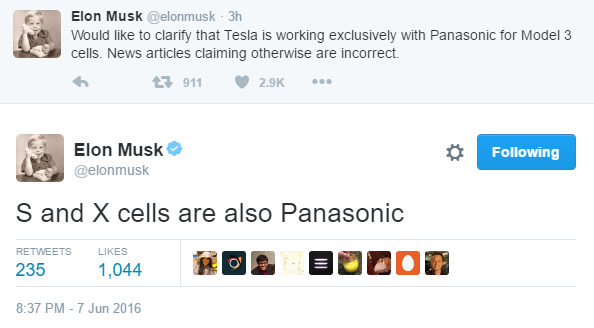 Elon Musk went on twitter last month to clarify that Tesla is working exclusively with Panasonic for battery cells of Model 3 as well as the Model S and Model X, following Reuters report about Samsung SDI being in advanced talks with Tesla to supply type 18650 batteries - similar cell format to Panasonic's - for the U.S. automaker's Model 3 electric car as well as its energy storage products. Sources: Reuters, Wall Street Journal.